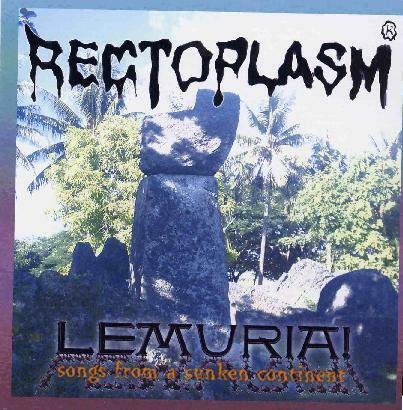 As far as concept albums go, Rectoplasm’s Lemuria! (subtitled “Songs from a Sunken Continent”) is one of the stranger ones you’ll ever hear, certainly on a par—at least conceptually—with anything their spiritual brethren The Residents have produced. As with most avant-rock that aspires to ironic profundity by intentionally undercutting the seriousness of the conceptual apparatus that supports and sustains the music itself, the ten songs on Lemuria! tread a very fine line between tongue-in-cheek pomposity and mock high brow pretensions to artistic and cultural relevance. But again like The Residents, what ultimately justifies Rectoplasm as a purveyor of postmodern art/music is the group’s unwillingness to draw such purely academic distinctions. The suitably arcane text that accompanies Lemuria! Only serves to enhance the almost Zappa-esque satire that the music itself documents and parodies. Briefly stated, the songs on Lemuria! are contemporary recreations of the music of an antediluvian culture that is reputed to have once thrived somewhere in the Southern Hemisphere. Rectoplasm’s reconstruction of the sub-microtonal musical alphabet of the Lemurians with the aid of a battery of synthesizers, percussion instruments and other exotica such as sitar, Aeolian harp and keramophone creates a striking rapprochement between the earthy and the otherworldly. And while the conceptual resemblance to The Residents’ Eskimo is palpable, many of the songs on Lemuria! display a diversity of musical influences: classical Indian music, early Berlin school electronics, Ligeti, musique concrete, Faust and even the driving industrial rock of Chrome are all evident throughout the song cycle that makes up this fascinating, though at times difficult to digest, album. Haunting, infuriating, trance-inducing, disturbing, pretentious, amusing, hermetic—Lemuria! never fails to evoke a myriad of responses from the listener. As a consequence, dolts and oafs need not apply for admission through these gates. However, for the musically adventurous Lemuria! is well worth your time and investment.